If within range of the docking station signal, it will move towards that. If not, it will head to the nearest boundary wire and use that to find its way back. 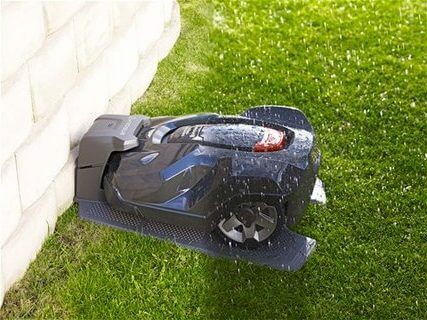 The Husqvarna Automower 315 is geared towards homeowners who have medium to large sized lawns, up to a maximum of 1,500 square meters. That is approximately around 16,000 square feet or around 0.37 acres. It has many features that you would find only in a high-end robot mower. This is one of the best garden mowers for busy folks who need perfectly cut lawns without having to put long hours into it. Without further ado, let’s dive into the review. 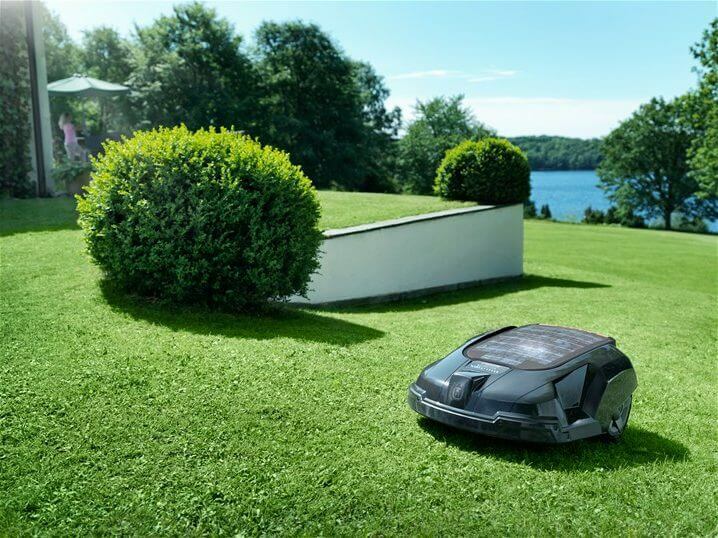 The Automower is a very rugged robotic mower. Since Husqvarna is a Swedish company, their products are built to withstand the elements like harsh Scandinavian winters. And this mower is no exception. The body is well insulated and made from tough plastics. The Husqvarna lawn mower robot also manages to look very futuristic, compact, and stylish. To be effective, automatic robot mowers need the ability to work in various terrain conditions. This mower is capable of handling up to 0.37 acres of lawn cutting. And with a four-wheel design, it can handle very uneven terrain conditions as well. Very few robot mowers are capable of handling steep inclines. But the Husqvarna lawn mower robot is a high-end model, capable of scaling very steep 22-degree inclines. The Husqvarna 315 is perfect for up to 1,500 m² lawn. Robotic mowers are designed to work within a well-defined perimeter boundary. Users have to set this up using a boundary wire provided along with the package. And the Automower also needs careful initial laying of the boundary wire. While it can handle steep 22 degree inclines in a straight line, this mower can only take 15-degree slopes when turning. So the boundary wire should be laid in relatively flatter terrain. The installation is not too hard, and they do provide expert assistance if necessary. With a 25W electric motor, this Husqvarna robot lawn mower is not the most powerful out there. So it is not designed to cut very thick and tall grasses. But for regular maintenance of shorter grass, this mower is more than adequate. 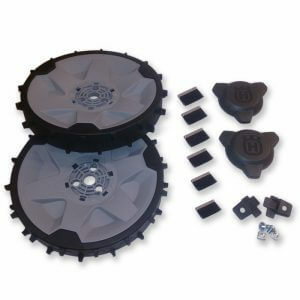 It has a very unusual cutting system, with three independent blades attached to a revolving hub plate. The blades combine to give a cutting width of close to nine inches, which is not too bad. The cutting height can be adjusted, between 0.8 to 2.4 inches. The initial setup is the only significant user involvement required. The robot mower has fully automated functioning. It will take care of all the mowing on its own, within the specified lawn area. And when it is low on battery, it will automatically dock into the charging area. And a bonus is the totally silent operation. You can adjust settings like daily mowing hours, and a weekly mowing schedule. 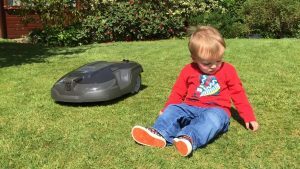 The robot mower is designed for continuous functioning. So it will keep trimming the grass throughout the day. 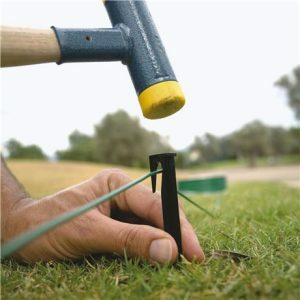 This has a special advantage: the grass clippings are so tiny, they disappear quickly in the soil and act as nutrients. The mower will work in all weather conditions, in hot summers as well as heavy rains. 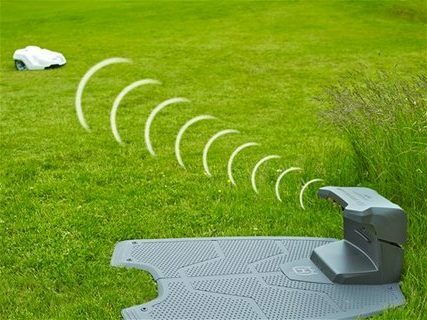 The robot mower will actively avoid any obstacles in its path, so it will not get stuck during the job. It is designed to cover around 730 square feet in an hour. If within range of the docking station signal, it will move towards that. If not, it will head to the nearest boundary wire and use that to find its way back. 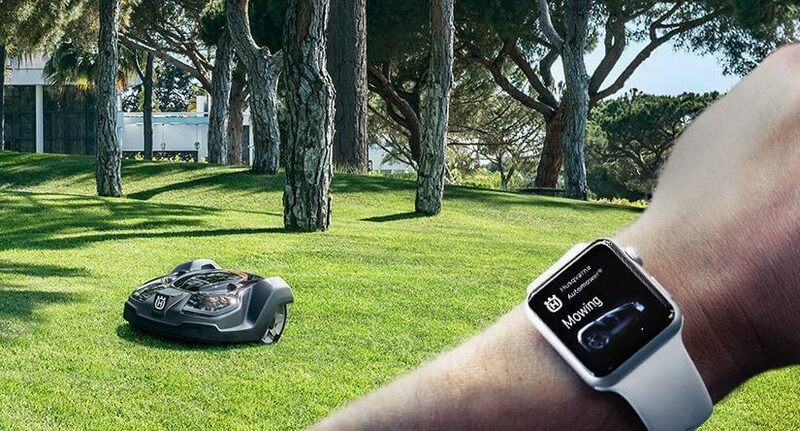 The robotic lawn mower also comes with an app that can connect you directly to the mower. The app is available for both iPhone as well as Android devices. Once connected, the app can be used to program all the settings mentioned above. It even has a map feature that works like a gps for your lawn. 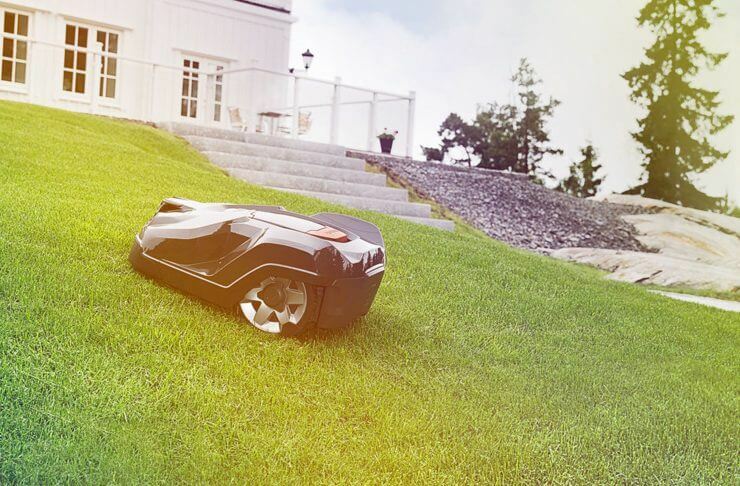 Husqvarna robotic lawn mowers are designed to give an alarm whenever they are picked up. So this lawn mower is not easy to steal. And even when stolen, the device is programmed to work with just one docking station. So it cannot be used elsewhere. The remote object detection feature helps this mower avoid obstacles, pets, and children. It also has a quick stop function that prevents the blades from rotating when the mower is picked up or tips over. 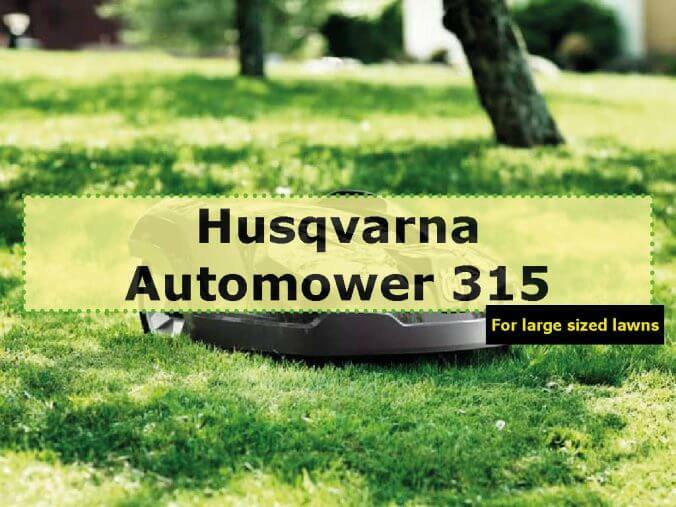 The Husqvarna Automower 315 is a premium robot mower ideal for owners of large lawns. If you want perfectly mowed lawns without spending hours cutting with an old-fashioned mower, this is the lawn mower you need. It will keep the lawn looking freshly mowed all the time. It is also a very eco-friendly and energy efficient mower. The only way it could be greener is if it were a solar hybrid mower.